2016 is almost up and, well, let’s just say it’s been an eye-opener for many of us. Certainly, it’s shown us that we can all stand to learn more — about ourselves, our audiences, and the world in which we operate as marketers. 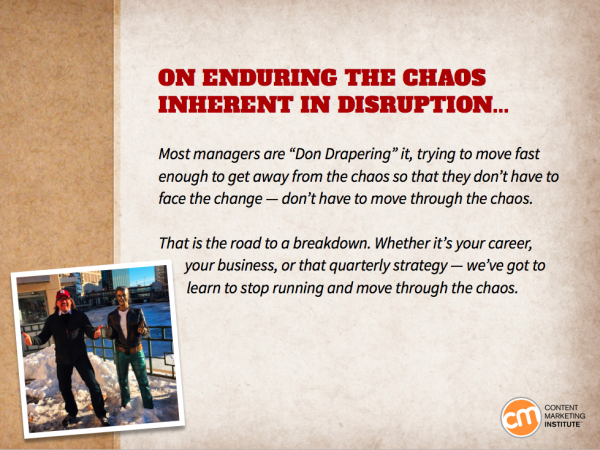 If we want to move our businesses forward in the face of any marketing challenges, we need to take every opportunity to become more informed about what’s happening around us and take greater responsibility for driving the changes we want to see. One of my favorite ways to increase understanding of our industry is through detailed e-books that look at the current landscape, map viable paths toward improvement, or simply inspire us to get a little creative in how we pursue our goals. The following are 11 of the top resources the CMI team produced in the e-book format over the past year — all of which are designed to support your upcoming efforts and better prepare you to achieve content marketing success no matter what the future may have in store. 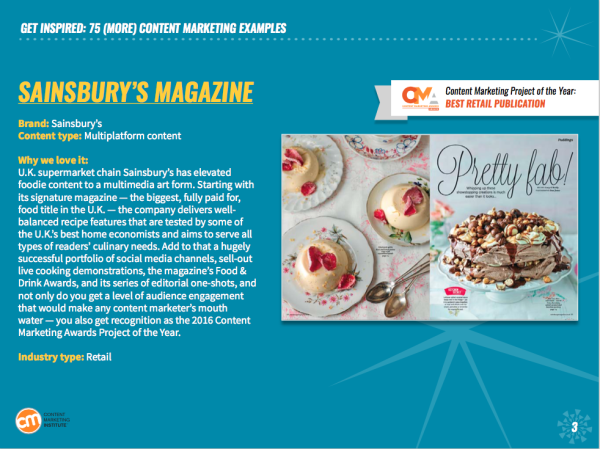 CMI’s annual research reports are among the most-cited studies across the content marketing industry. For 2017, our team took the conversation in a new direction by more closely examining certain tactics, techniques, and specific actions that the most successful organizations use. For example, our B2B study found that 85% of top performers deliver content consistently compared to 58% of the overall sample and 32% of bottom performers. 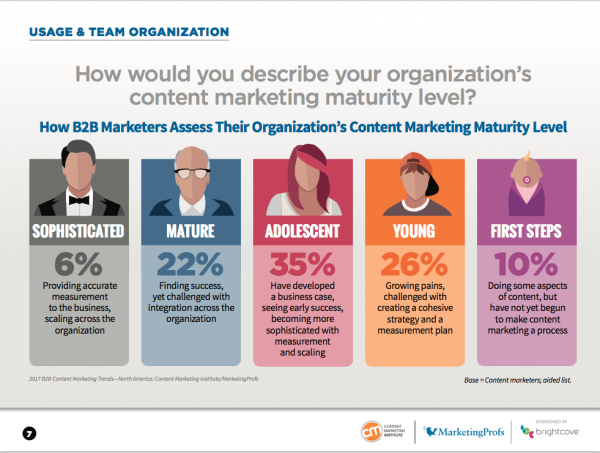 Not only do the results point content marketers toward best practices for various industry segments (including B2B, B2C, manufacturing, and nonprofit organizations), they also serve as an accurate reflection of our industry’s evolution. A lot has changed since CMI unveiled its first framework of the principles governing content marketing in 2014. To reflect the shifts we’ve experienced throughout the industry’s evolution — and the insights we’ve gathered along the way — we’ve updated and enhanced our original discussion. Think of this e-book as a syllabus of sorts, covering the five core elements necessary for running successful, scalable, and highly strategic content marketing operations. 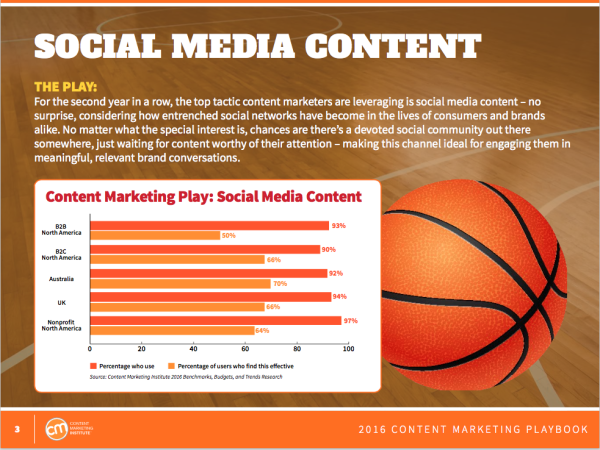 Every business brings a unique set of goals, resources, and values to the content marketing table. But as an industry, we can all learn a little something from these 75 brands that conquered their content marketing challenges with creativity, ingenuity, or simply a strong commitment to providing audience value. Updating one of our most popular e-books of all time, this year’s example collection also illustrates best practices for a wide range of tactics and formats — from mainstays like blogs and print magazines to virtual-reality-enhanced efforts, seamlessly integrated multichannel experiences, and more. Today’s search engine algorithms do a pretty good job of using input like keywords, content quality, and uniqueness to rank content by its relevance. But, according to Rand Fishkin, those formulas are well on their way to learning from actions taken on previous searches and predicting intent, and applying that contextual information to provide a more meaningful search experience. 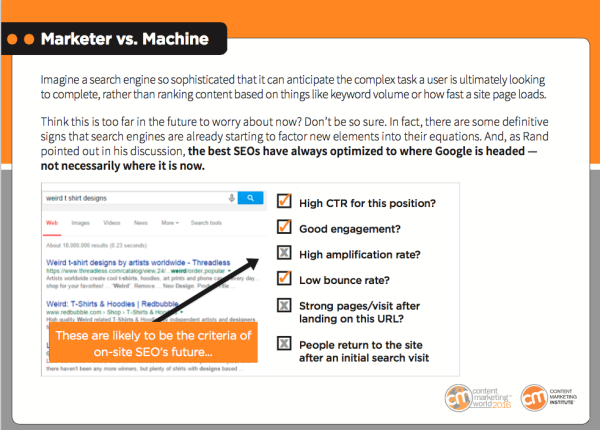 This e-book covers the basics of SEO in the machine-learning age and offers tips to help you prepare your content for the coming of our benevolent search-bot overlords. 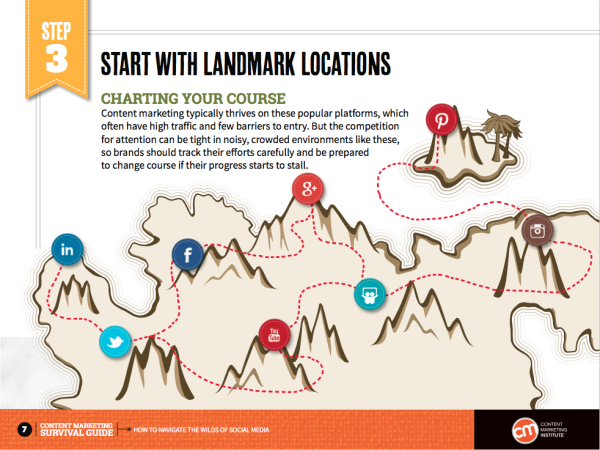 If finding the right format for communicating at the right time and place is something you struggle with, our latest Content Marketing Playbook can help you make more informed decisions. Covering 24 of the most popular content types, this e-book offers stats on their use and effectiveness among your industry peers, tips to help with content creation, and essential considerations for achieving success with the tactics you select. This collection of smart and prescient insights is (IMO) sadly lacking a cover image depicting CMI’s chief content adviser posed as Rodin’s The Thinker. 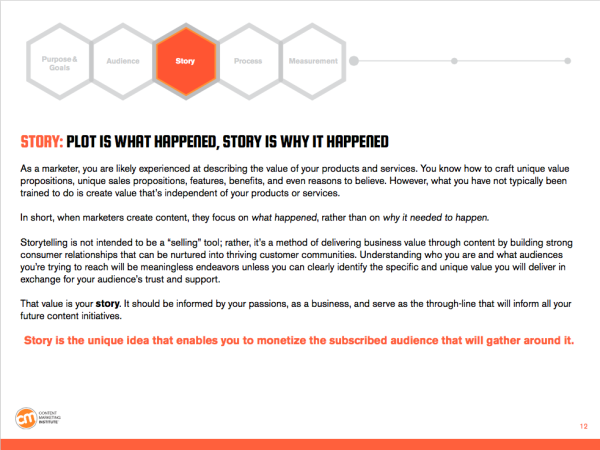 But it does include current concepts, innovative ideas, and critical discussion points that may come in handy as you build and execute on a successful content strategy. Use Robert’s words of wisdom as signposts to keep your efforts on track or simply to spark thoughtful conversations on the role that content strategy should be playing in your organization. Tracking your audience through the social media jungle is not for the faint of heart — plenty of perils can befall a foolhardy brand that enters these landscapes unaware and unprepared. This update of our original 2014 e-book has everything you need to thrive in the most popular social environments, explore emerging territories, and avoid getting ensnared in dead-end conversations or plagued by dried up Vines (2012-2016 RIP). 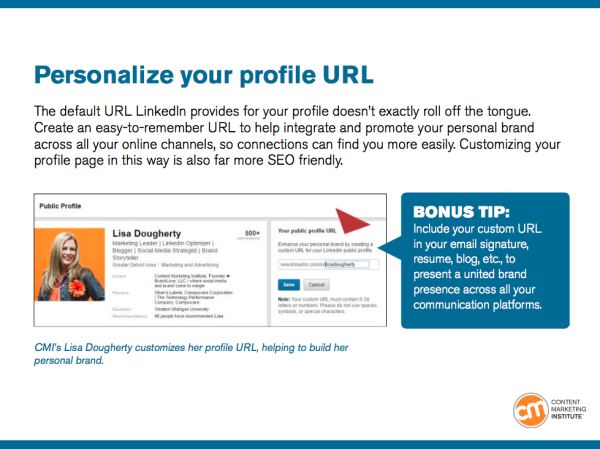 CMI’s Lisa Dougherty compiled an unbelievably comprehensive guide for turning your average LinkedIn profile into a substantive showcase of your content marketing talents and career achievements. The full process can take some time, though, so we put together an e-book of the top highlights, which will get you started while preparing you to make some more impactful changes over time. Working with top thought leaders, social influencers, and other high-profile content creators in your industry can quickly propel your business into the big leagues in terms of credibility, visibility, and brand loyalty. But with so many strong voices and channels to consider, it’s hard to know which players to pursue and how to position your content for optimal success. 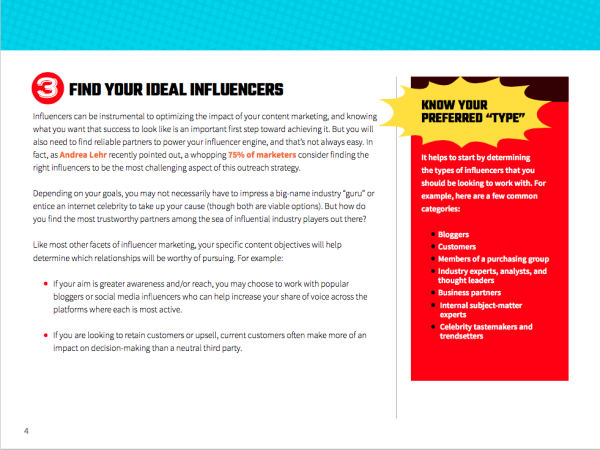 This updated guide offers plenty of new tips, processes, and industry-leading advice to help marketers identify and engage the right influencers and drive greater value from their influencer collaborations — without getting overwhelmed by all the options. Even if you’re accustomed to tracking your content marketing performance with Google Analytics, chances are you’re still leaving some critical insights on the table. 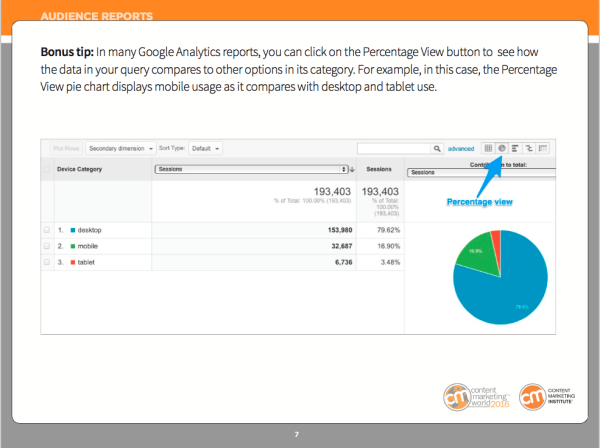 Google Analytics is a powerful measurement tool, but its complexity means it’s not always easy to find the data you need most. This overview of Andy Crestodina’s top-rated Content Marketing World presentation will show you how to compile relevant reports, get answers to your most pressing performance questions, and take actions to improve your potential for success. If recent events have taught us anything, it’s that predictions are rarely 100% accurate. But even when they fail to hit a direct bulls-eye, they can still help keep you focused on your targets and priorities. 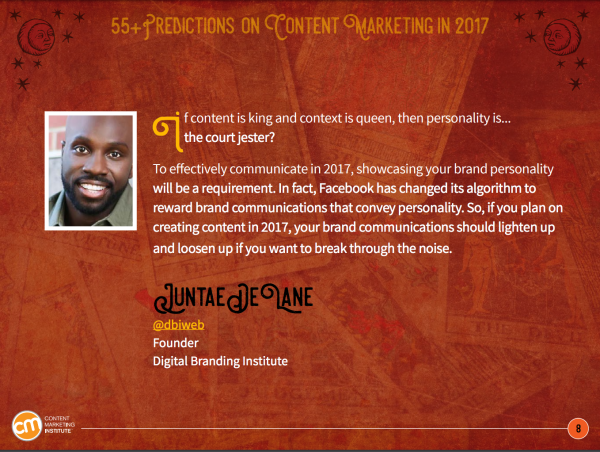 In our ninth annual predictions book, you’ll find out which content marketing trends some of our industry’s top experts are keeping in their sights — including shifts in enterprise-wide content creation, paid amplification, and audience development — and how their insights might prepare you to face your challenges head-on in the coming year. As 2016 draws to a close, the CMI team is already hard at work on new ideas, insights, and advice to help content marketers conquer their challenges — large and small. But we’d love to hear what topics you would like to see us tackle in future e-books. Feel free to share your thoughts in the comments or connect with us any time you need a little reassurance that it will all be OK (content-wise, at least). 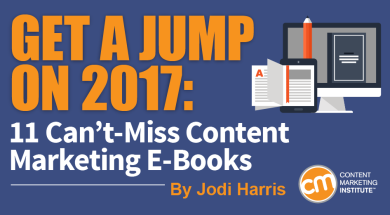 Want to ensure that you receive all of the latest e-books from the Content Marketing Institute? Subscribe to our free daily newsletter.